By reflecting up to 86% of the sun’s energy, Duro-Last’s white membranes can greatly reduce energy consumption and costs. With a total solar emittance of 95%, the Duro-Last membrane is ENERGY STAR® qualified, meaning that this roofing system releases energy and heat efficiently. Duro-Last’s high reflectivity is particularly helpful in reducing peak energy demand, or the sharp peak in electrical demand observed in almost every building during the busiest hours of the day. Peak demand is a problem because it raises the cost of power usage. Cool roofing technology is one of the best ways to shrink peak demand. 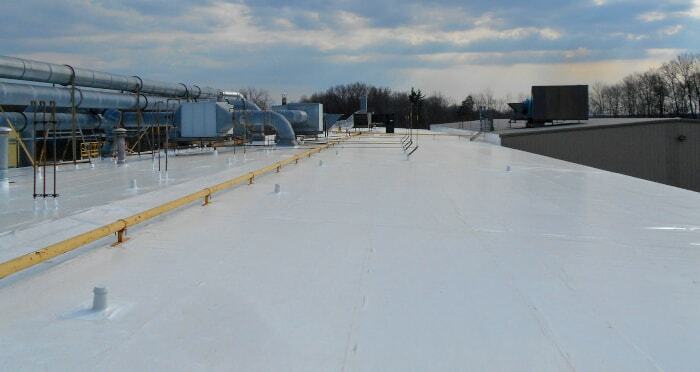 A net energy savings is available by utilizing cooler white roofs for both new and existing buildings. A Duro-Last Roofing System, installed by Umbrella Roofing Systems, Inc., stays flexible and watertight-even after years of exposure to harsh conditions. It means that a Duro-Last roof resists the negative effects of prolonged ultraviolet exposure and helps reduce heat stress on rooftop equipment. With a white Duro-Last roof, HVAC units don’t have to work as hard because the air around them is cooler. Most authorities have concentrated on reflectivity as the prime measurement of energy performance of cool roofing. Because Duro-Last material is highly reflective, it does not absorb as much of the sun’s energy as conventional black roofing material. Also, Duro-Last releases the energy efficiently, it won’t cause a roof to heat up. Conventional black roofs tend to absorb and then inefficiently radiate the sun’s energy, causing increased high temperatures on a roof. As a result, over time, UV Rays break down existing black roofs.